At Hickok Cole we strive to make every project as sustainable as it can be. We do this by initiating conversations focused on sustainability at the outset of every project. The Owner and engineers are engaged in goal setting: integrating sustainable design strategies early on in the process is the key to success. In June of 2017, Hickok Cole officially signed the AIA 2030 Commitment, joining more than 400 firms in this global initiative to design more carbon-neutral environments. Learn more about the AIA 2030 Commitment. We are currently in the process of building the largest Net Zero Energy office building on the East Coast, the headquarters of the American Geophyscial Union. 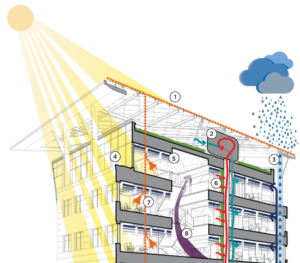 Features of the building include a Solar PV array, a sophisticated radiant cooling system, a hydroponic phytoremediation wall, an innovative direct current power grid, a large water cistern, and the country’s first sewer heat exchange system. Visit the Building AGU site to see the building progress. Download a whitepaper pdf to learn more. We have also been aiding Washington DC’s Department of Energy & Environment fulfill its ambitious sustainability goals by completing research through grant work into city-wide buildings, planning projects along the Anacostia River, investigating campus-wide solar application and revitalizing Kingman and Heritage Islands.